'Fresh Air' at 20: Jerry Seinfeld Fresh Air went national in 1987, and we're celebrating that 20th anniversary by revisiting some classic interviews. First up: Jerry Seinfeld, who sat down with Terry Gross before Seinfeld made him a star. Rebroadcast from Sept. 2, 1987. Fresh Air went national in 1987, and we're celebrating that 20th anniversary by revisiting some classic interviews. First up: Jerry Seinfeld, who sat down with Terry Gross before Seinfeld made him a star. That hit TV show, of course, catapulted the comedian to fame and won six Emmy Awards before ending its run in 1999. 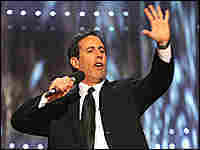 The 2002 documentary Comedian, which followed Seinfeld on a stand-up tour, is available now on DVD. Rebroadcast from Sept. 2, 1987.